Well, it’s that time of the year again. That glorious, marvelous time of the year where everywhere you look, pumpkin-flavored coffee and treats are crowding the shelves of your local coffee shops and bakeries. Fall is here! It doesn’t matter that we hit 90 degrees with 175% humidity last week. What matters is that you can swing by your local Starbucks and pick up a Pumpkin Spice Latte, even if you do have to enjoy it in the comfort of your air-conditioned office instead of sitting in the park, admiring the changing leaves. The good news is, Mother Nature seems to have realized how silly it is to have all of this pumpkin goodness without the comfortable Autumn weather to go along with it, because this week has been cooler and much more Fall-like. 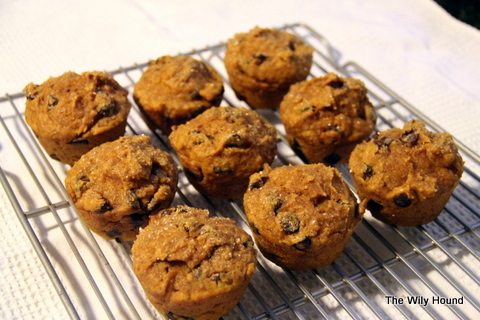 I couldn’t help but jump on the bandwagon and try out some pumpkin-based recipes, and I’m happy to report that this pumpkin chocolate chip muffin recipe yielded some pretty delicious muffins. 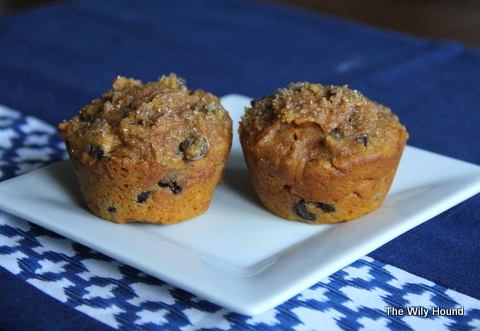 They’re flavorful and moist and perfect to go alongside your morning latte. (Just make sure you’re using pure pumpkin puree and not pumpkin pie filling.) Enjoy! 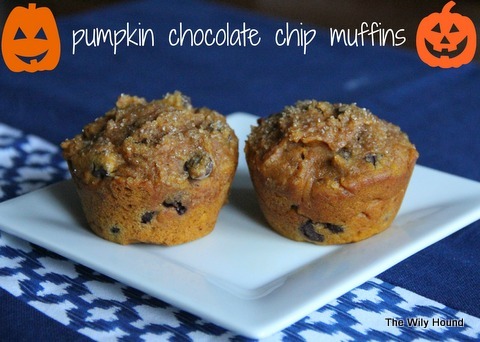 Combine the flour, baking powder, salt, and pumpkin pie spice in a bowl and set aside. In a large bowl, combine the vegetable oil, sugar, egg, milk, and pumpkin until smooth. Stir the dry ingredients into the wet ingredients until just combined. Fold in the chocolate chips. Spray a cupcake pan with non-stick baking spray (or line the pan with cupcake liners). Fill the pan using about 1/3 cup of batter at a time and sprinkle the turbinado sugar over top. Bake for 18-22 minutes, or until an inserted toothpick comes out clean. Cool on a wire rack for 15 minutes before removing them from the pan.